Barry Allen won’t be the only superhero running around when The Flash comes back in the fall. In addition to Firestorm stopping by before Legends of Tomorrow, Jay Garrick, the Flash from Earth 2, will be debuting. Now a former WWE superstar has been added to the ranks, and while his character is a superhero in the comics, he’ll actually be fighting the good guys in the DC TV universe. Former wrestling great Adam Copeland, known in the ring as Edge, will be playing Atom Smasher in The Flash Season 2 premiere. According to Comicbook.com, Atom Smasher will try to kill the Scarlet Speedster using his incredible strength and gigantic size, and when Barry can’t beat him on his own, it will depend on the entire S.T.A.R. Labs team to come together to defeat the new adversary. Atom Smasher sounds like the hero that several actors were seen auditioning for online. In the leaked videos, the mystery hero’s powers were mentioned as difficult to understand, and in another scene he’s arguing with Barry about how he handled a showdown with an unidentified metahuman. So although Atom Smasher is a villain in his first episode, he might be working alongside Barry in the field. In the comics, Atom Smasher (real name: Albert Rothstein) inherited his super strength and size-changing ability from his super villain grandfather Cyclotron. 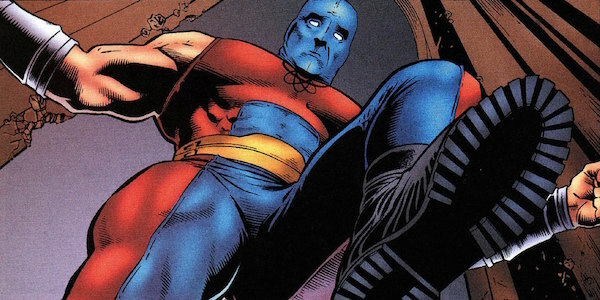 Albert first began his fighting career as Nuklon, but later renamed himself Atom Smasher, and was eventually recruited into the Justice Society of America. He is also the godson of Al Pratt, the Golden Age Atom. Although the source of Atom Smasher’s powers in The Flash wasn’t revealed in the announcement, an Albert Rothstein was mentioned in the episode “Power Outage” as one of the people who perished from the particle accelerator explosion. This implies he gained his powers like most of the show’s other metahumans; and like Ronnie Raymond, reports of his death were greatly exaggerated. Atom Smasher’s only appearances outside the comic books have been cameos in Justice League Unlimited and Injustice: Gods Among Us. While best known for his wrestling career from 1999-2011, Copeland has been acting since 2000, when he cameoed in the film Highlander: Endgame, and he has appeared as himself on shows like Weakest Link, Deal or No Deal and MADtv. He can currently be seen on the Syfy series Haven as Dwight Hendrickson. The Flash returns with new episodes for Season 2 on Tuesday, October 6 on The CW.